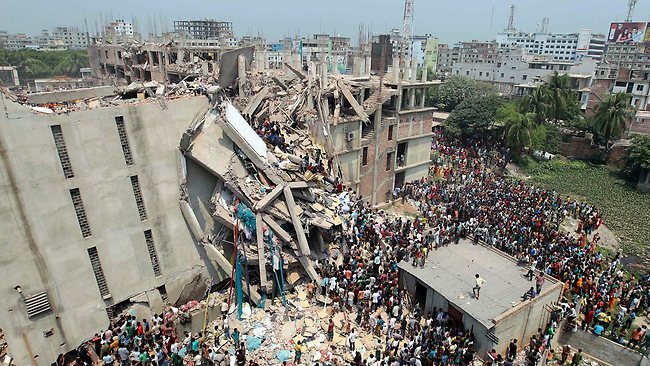 You probably heard about the horrible tragedy at the garment factory in Bangladesh last month. More than a 1000 workers died when the factory they were laboring in collapsed. Some American brands that source their products from Bangladesh are scrambling to come up with “solutions” to address the fact that there are very few protections for workers in Bangladesh. Other brands don’t seem as concerned. The day before yesterday, President Obama suspended trade privileges with Bangladesh. The hope is that this will pressure factory owners there to improve working conditions for their garment workers. I hope it does. But it might not. And can you imagine how you would possible monitor the working conditions of the 6500 garment factories in Bangladesh? I have an easier idea. Buy apparel made by members of our extended American family here in the States. Only 2% of the apparel we buy these days in America is sewn here. According to Save the Garment Center, as recently as 1965, 95% of the apparel we bought was made on these shores. Let’s move that 2% figure back to something respectable, say 50%. All we have to do is change our buying habits a bit. Just this last week I went to the Brooks Brothers yearly men’s sale and bought four beautiful American made Oxford dress shirts on sale for $45 each. I bought four last year for the same price and after a year of wear, they still look brand new. I also went to Nordstrom and bought a beautiful Joseph Abboud suit on sale for $450. You can join in this effort and it is easy. Buy some great American made Jack Donnelly Khakis made by my buddy Gregg Donnelly. Buy some American white dress shirts made by White Dress Shirts.com in the Big Apple. Buy some beautiful Karen Kane dresses. Just buy something made by members of our extended American family! I leave you with a wonderful list of Made in America apparel makers graciously provided by the fine people at Save the Garment Center. Also, check out this CNN piece on American made apparel. And finally, don’t forget to check out my friend Jack’s wonderful blog on apparel made in this country. This entry was posted in american made, Apparel, Made in America, made in usa, Men's Wear, shopping and tagged Bangladesh, Brooks Brothers, Clothing, Joseph Abboud, Karen Kane, Made in America, made in america apparel, made in america products, Made in the USA, made in the usa apparel, Made in the USA products, Save the Garment Center. Bookmark the permalink. Thanks so much for the plug. On the “Made in the USA” Brooks Brothers shirts, you must have gone to one of the main Brooks Brothers stores, because they don’t carry them in the outlets. I did like the CNN piece about Bangladesh making apparel, and the fact should be emphasized just because it is made overseas doesn’t mean it will be cheap. I disagree with the statement with the last spokesperson that if we spent one dollar more on the imported garments that the workers would get better conditions and wages. No, that is a total fallacy, that extra dollar will go directly into the pocket of the owners. Better to buy American. Better quality and it creates more American jobs. -Jack A from clothingmadeintheusablog.